ARE, Sweden (AP) — Mikaela Shiffrin 1, Petra Vlhova 1: Over to the slalom to determine who is the queen of the skiing world championships. Vlhova won the latest episode of what is rapidly emerging as the biggest female rivalry in the sport by capturing gold in the giant slalom on Thursday to become Slovakia's first world champion. Coping best in winds that reached 70 kph (43.5 mph) amid unseasonably mild temperatures in central Sweden, Vlhova used her size and power to negate a 0.19-second deficit to Viktoria Rebensburg after the first run and beat the German by 0.14 seconds. Shiffrin took bronze to add to the gold medal she won in the super-G on the opening day of competition. Asked if the slalom on Saturday will determine the best female ski racer of the championships, Vlhova — the gold medal round her neck — leaned back on the sofa, made herself comfortable, and had a twinkle in her eye. "We will see on Saturday, she said, "but sure it will be a good fight with Miki." Aged 23 like Shiffrin, Vlhova is proving to be the biggest threat to the American's dominance of Alpine skiing. The Slovakian is the only racer to beat Shiffrin in slalom this season and she also won two giant slaloms on the World Cup circuit recently — tying with Shiffrin in the final GS before the worlds. 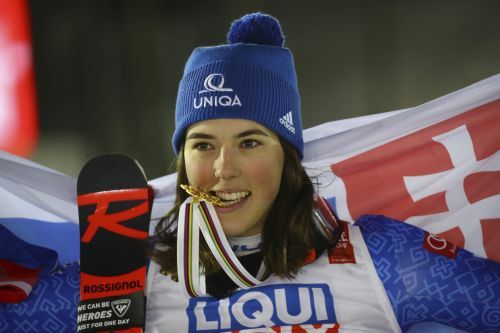 This win, which added to the silver she won in the Alpine combined on Friday, took her to a new level. "Finally," Vlhova said, "I showed to everyone who is Petra from Slovakia." Shiffrin knows about her, all right. "It's motivation," she said. "It's inspiring in some ways." Shiffrin said she lost some self-belief once she saw the conditions in the morning, when it rained for the second straight day to add to the strong winds that forced organizers once again to shorten the course. There was already added external pressure on the American after she chose to skip the combined — to the surprise of some, including Lindsey Vonn — to preserve energy for the giant slalom and slalom. The careful planning didn't pay off. Shiffrin was 0.44 seconds off Rebensburg's lead following the first run, after which she acknowledged that she struggled to get a "response from the surface." It meant, she said, that she skied "a little too safe." Determined to ski more aggressively in the second leg under floodlights, Shiffrin turned in only the sixth fastest run and ended up happy just to claim third place for her sixth world championship medal — just two off the American record held by Vonn. "Coming away tonight with a bronze, after a gold in super-G, is very much a dream come true," Shiffrin said. It was so windy ahead of the second run that organizers removed the banner above the finishing line. Shiffrin said the gusts pushed her backward at the starting gate. Vlhova, taller and more robust than Shiffrin, relished the conditions. She even overcame crashing into a gate in between the second and third checkpoints of the second run, which saw her briefly lose control. Racing second to last, she leaned back and clenched her fists after beating the time of Shiffrin. Then she put her hands to her head when Rebensburg crossed the line with the second-best time even though the 2010 Olympic champion had a lead of 0.40 seconds at the third checkpoint. Add Vlhova to the list of the most successful athletes in Slovakia, which already contains tennis player Dominika Cibulkova, cyclist Peter Sagan, soccer player Marek Hamsik and ice hockey player Zdeno Chara. "Sometimes, she said, "it's really hard and you have a lot of pressure because in Slovakia, we are a small country and we have just a few athletes like I am." There's still so much more to come, too, from Vlhova, who said she might start competing in speed events "because we knew from the summer I can be really fast." Shiffrin sure has some company at the summit of women's ski racing. Why do Indian tennis players find it so difficult to cross the bridge from juniors to seniors?